« Why the Red Carpet Really Does Matter! Fashion Whip is a political style column in the Huffington Post by Lauren A. Rothman, inspired by Lauren’s experience as the founder of Styleauteur, a style and fashion consulting firm. 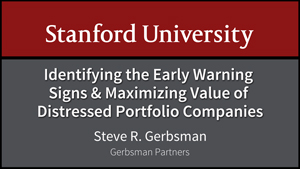 A video taped a presentation on “Corporate Governance”, “Early Warning Signs” and “Maximizing Value” for under-performing/distressed venture backed Intellectual Property companies at Stanford University. This video will be for used in the Stanford Engineering School via STVP (Stanford Technology Ventures Program) and SCPD (Stanford Center for Professional Devlopment). Please visit the attached link to view the program. Gerbsman Partners focuses on maximizing enterprise value for stakeholders and shareholders in under-performing, under-capitalized and under-valued companies and their Intellectual Property. Since 2001, Gerbsman Partners has been involved in maximizing value for 80 technology, medical device, life science, digital marketing/social commerce and solar companies and their Intellectual Property and has restructured/terminated over $810 million of real estate executory contracts and equipment lease/sub-debt obligations. Since inception, Gerbsman Partners has been involved in over $ 2.3 billion of financings, restructurings and M&A transactions.